Greenland has been (partly) white for a very long time, when will it turn green again? Today Anthony Watts has an article about Greenland (archived here). He copied a press release about how scientists have evidence that the ice sheet in Greenland could be 2.7 million years old. This could be something of a surprise, because recent thinking was that the ice sheet may have almost disappeared in MIS 11, about 400,000 years ago (eg Alley et al 2010). The new discovery indicates that even during the warmest periods since the ice sheet formed, the center of Greenland remained stable; "it's likely that it did not fully melt at any time," Vermont's Bierman said. This allowed a tundra landscape to be locked away, unmodified, under ice through millions of years of global warming and cooling. The scientists examined the lowest 13 m of the GISP2 core, which had not been examined closely. 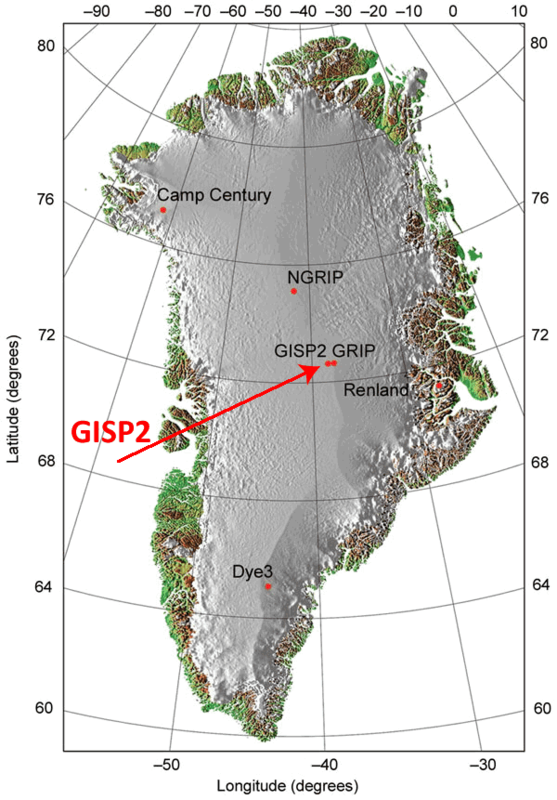 GISP2 is in central Greenland. That lowermost section of the core had a lot of sediment in it. The team used measurements of measurements of atmospherically produced (meteoric) 10Be, carbon and nitrogen in the sediment to figure out things like where the sediment came from and how old it was. What they discovered was that below the silty ice in the lowest 13 m of the core was 48 cm of diamict lying over granite. The ice at the summit is frozen to the bed and, through modeling, the scientists estimate it's been in place for "at least the last several glacial cycles". ...The researchers expected to only find soil eroded from glacier-scoured bedrock in the sediment at the bottom of the ice core. “So we thought we were going looking for a needle in haystack,” Bierman said. They planned to work diligently to find vanishingly small amounts of the beryllium—since the landscape under the ice sheet would have not been exposed to the sky. “It turned out that we found an elephant in a haystack,” he said; the silt had very high concentrations of the isotope when the team measured it on a particle accelerator at Lawrence Livermore National Laboratory. “On a global basis, we only find these sorts of beryllium concentrations in soils that have developed over hundreds of thousands to millions of years,” said Joseph Graly, who analyzed the beryllium data while at the University of Vermont. Without going into too much detail, what I gather is there was too much 10Be in the soil for anything but a very long period of exposure to the atmosphere. Longer than would have been possible if the soil had been exposed in more recent interglacials. They concluded that "the data are most consistent with soil formation prior to the existence of the present GIS". And given that it's still there intact, they concluded that the ice sheet has been very stable at the base and has been there for the best part of the past 2.7 million years. Before that, it was likely tundra. In fact the 10Be under the Greenland ice sheet was found to at levels very similar to the permafrost tundra in Alaska today. Many geologists are seeking a long-term view of the history of the Greenland Ice Sheet, including how it moves and has shaped the landscape beneath it -- with an eye toward better understanding its future behavior. It's 656,000 square miles of ice, containing enough water, if fully melted, to raise global sea levels twenty-three feet -- "yet we have very little information about what is happening at the bed with regards to erosion and landscape formation," said Corbett. What is clear, however, from an abundance of worldwide indicators, is that global temperatures are on a path to be "far warmer than the warmest interglacials in millions of years," said Bierman. "There is a 2.7-million-year-old soil sitting under Greenland. The ice sheet on top of it has not disappeared in the time in which humans became a species. But if we keep on our current trajectory, the ice sheet will not survive. And once you clear it off, it's really hard to put it back on." This puts the final nail in the coffin for last year's WUWT article about how Greenland ice sheet was only 650 years old. That article had a not-so-brief appearance at WUWT before Anthony finally responded to the guffaws (even from deniers) and took it down. Least we forget that the Vikings grew crops on Greenland 1000 years ago where permafrost exists today. Expanding on the authors’ pop commentary we must conclude that Erik the Red knew this and decided to wait it out. I’d suggest that it’s more likely humankind and other species are likely to disappear before the Greenland ice sheet does. One needs to remember that the earths continents are tectonic plates in very slow motion. Anybody think they know where the current continents are going to be in say 1-100 million years from now and what species will still exist. Your guess on that question maybe more accurate than current prognostications about what a few 100 parts per million increase in CO2 will do to all earths species. I beg your pardon? Talk about an agenda-powered presupposition, in bold face. That slithered by the reviewers like sub-glacial slime mold. April 17, 2014 at 5:53 pmThis raises the interesting possibility of finding fairly fresh remains of long extinct species, either in Greenland or Antarctica. The first problem being that ~10% of the bottom core is folded. The second problem is that no ice dated older than 105,000 years has been described in the literature to my knowledge, which is what makes this somewhat dubious. It is exceptionally difficult to age date ice, particularly if it has been disturbed. It normally requires layer counting, registration with known tephras (volcanic ash layers) etc. etc. So I will be interested to see how they dated this ice to some 25 TIMES older than the oldest known ice (at least known to me). If William had read the paper or the press release or Anthony's article, he'd have seen that the scientists weren't dating ice, they were dating the soil and sediment at the bottom of the ice. What’s our current trajectory? Warming or cooling? The money quote at the end. Scientists prostituting themselves for the globalist cause. Well, they always wanted to become the benevolent technocrat dictators of the entire world anyway. They’re all giddy for dictatorship. What bothers me in reading this is how any climate scientist – or any layperson with an IQ over 90 – not come to realize the true magnitude of global climate variability, and from this see that the amount of increase in the latter part of the last century was nothing new or out of the norm? The spin is so apparent as to be nauseating – and to suggest we are headed for being warmer than any previous interglacial? Really?? Why not post some numbers from prior interglacials and let’s compare, rather than make some comment that some would take as truth because some “expert” said it is so. What is clear, however, from an abundance of worldwide indicators, is that global temperatures are on a path to be “far warmer than the warmest interglacials in millions of years,” said Bierman. Even at high end warming estimates it would take hundreds of years to melt the Greenland ice sheet. The problem for future generations is that they will never have stable coastlines. They gave ti add the last bit to get their paper published. Even though they know that this planet has done nothing but cool through it’s life. For more than three decades, Science and the American Association of Science have been allied to fraud and malfeasance, unethical behavior and lack of morality. Yet again, “Science” stands up to be beheaded yet again. I am getting tired of the time frames used in some of these models papers and reports, 2 million years here, 4 million years there. I have lived and farmed on my property for a little over 25 years in some places the land has “settled” 6 to 10 feet (ok, 2-3 mtrs) without a 2 mile icecap. Add to that that in a news item today the “Keppler” scientists have found an earth like “Rockey” planet 500 light years away in a solar system where it is called “Kepler186-F” . Sorry but can some one help me here ? How can we see a “rockey” planet the size of earth 500 light years away? (We can barely see ice movements in the arctic from a 100 miles up!) In a solar system that has a red dwarf star (less bright than our sun). Can some one put that in physical perspective . This is a grain of sand and then compare it to what Keppler 186f would look like from our point of view. I know the answers are going to include ” the permutations of the orbits of the other planets etc etc I do not believe for one second the scientists coming to these conclusions are much different than Mann etc . The conclusions they give are almost, if not impossible, to contest they have all the funding to keep on keep on going on. The Keppler project is important but do they have any template to hold up, ( gee maybe I am getting way to skeptical.) to compare their findings of today with? By the way, "last year's WUWT article" should link here. What an archeological treasure, especially that sober first comment. Yes, it could change a bit of thinking about where the sea level rise came from in the past - and in the future. And yet Asybot argues from incredulity. It's a funny old world. Asybot is neither "getting way to [sic] skeptical" nor too stupid but rather is in the happy condition of simple ignorance, something easily cured. Liberation from self-incarceration in Watts' anger factory is the first step to improvement. This is what is so pitiful and sad about the deniers. Instead of saying "gosh, wow, fascinating - I had no idea such useful data could be recovered from the bottom of the GISP cores; what clever buggers these scientists are, hats off" they flip into denial mode.